Credit for the 2 photographs goes to Hagley Museum and Library. 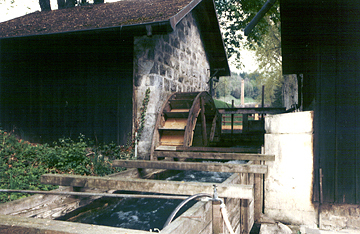 The first one is a wheel mill house that has been restored to its original water power. 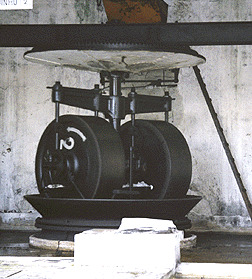 The second one is of an 8 ton mill wheel. This is where I will touch on the types of powder that are THE ONLY SAFE powders to use in a blackpowder firearm. I would like to say at this time that there is ONE and ONLY ONE type of muzzleloader that does permit the use of smokeless powder in them. This is a new muzzleloader on the market. It is a Savage model 10. However to use smokeless in any other type of muzzleloader UNDER ANY CIRCUMSTANCES CAN CAUSE INJURY OR DEATH TO THE SHOOTER AND BYSTANDERS! Before I list the brands of powders, I would like to explain the way they grade blackpowder. It is designated by burn rate. The slowest burn rate of powder is classified as musket grade powder. The middle grade of powder is rifle grade and the fastest burning powder is the sporting grade. I will list the powders along with their classification along side. Another thing about blackpowders is that they are not only graded by burn rate but also by grain size. If you look at a can of powder it may say 1fg, 2fg, 3fg, or 4fg. These are the sizes of the individual powder kernels. They use screens in the powder making process. First let me state that this is not a standardized process. What one company calls 2fg might be another companies 3fg or even 1fg. It just depends on the company. KIK Powder- This powder originates from Slovenia. It is a rifle grade powder. WANO- This is a German powder. It is a musket grade. GOEX- This is an American made powder. It is a rifle grade. ELEPHANT- This powder is made in Brazil. It is rifle grade. SWISS- This powder is made in Switzerland. It is sporting grade. I think it worthwhile to note that it has only been in recent years that American shooters have had the opportunity to purchase a sporting grade powder. News of this powder is traveling fast and more and more shooters are trying this powder. However, because it is a sporting powder greater care must be taken when using this powder as it does burn faster and pressures are achieved rather quickly with not nearly as much powder as we are accustomed to using of the rifle grades of powders. I personally have not tried the KIK or the WANO powders. I have however shot Goex, Elephant and Swiss. I am not going tell you what to use in your rifle. That is up to the individual shooter to determine which powder works for them. Cleanshot- This is a reformulated powder that used to be called Black Canyon. It is essentially a Vitamin C based powder. Clearshot- This is made by Goex. It is essentially a sugar based powder. Pyrodex (either loose or pellets)- This is probably the most well known blackpowder substitute on the market today. It is available as loose powder or in pellet form. All powder is measured volumetrically. This means that you take your powder measure and set it to say 70 grains. You fill it up and what powder will fit in this amount of space is volumetrically 70 grains. It may or may not be an actual weight of 70 grains. This is particularly true if using Pyrodex. Pyrodex is lighter in weight than blackpowder however loading volumetrically as I've described will give the same ballistic equivalent. Another thing to consider. If you choose to use Swiss powder you must reduce your powder charges. You will find that if using Swiss powder you will pass the laws of diminishing returns much faster. What this means is that you are increasing your powder charge, however you are getting only a few fps (feet per second) difference in velocity. You will see this if you shoot your rifle over a chronograph.